OS ref: SY 987 987 and 50.788050°N, -2.019361°W. 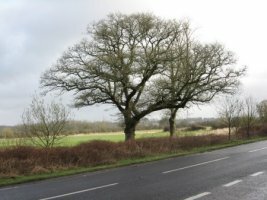 We hope to raise a TPO to protect the oak from any widening of the A31, only 11 metres away. I want to ensure that Candy's Oak does not mysteriously disappear overnight, but at least is given a proper trial before execution. 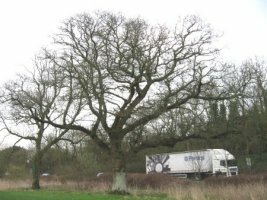 The tree is a mature Quercus robur, healthy, well proportioned, with a girth of 300 cms and stands 80 metres East of an old bridleway and 11 metres North of the A31. 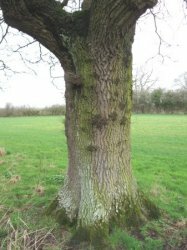 Apart from a smaller ash on the East side, there is no other tree of similar stature for almost a kilometre, the nearest known being the Waterman's Oak (800 metres to NNE), and an unnamed oak 1,100 metres to the NE. 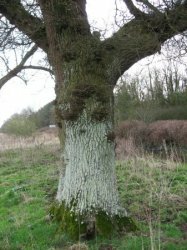 The oak stands on the floodplain of the Dorset Stour, which is 600 metres to the North, and must have withstood hundreds of winter floodings. 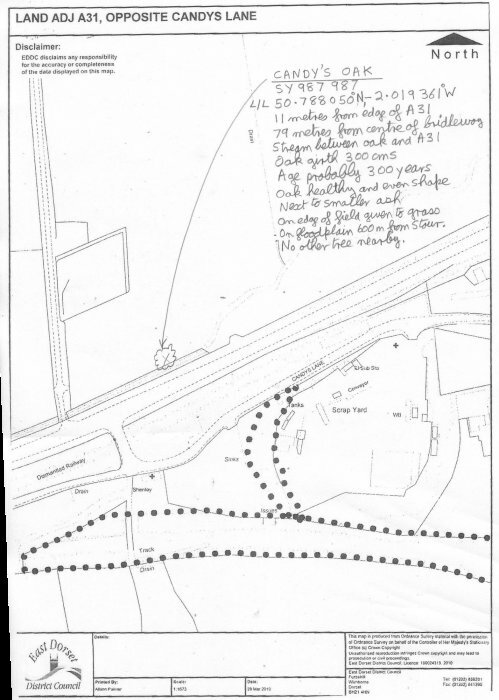 There is a small but important stream between the oak and the A31, which drains into the Old Mill Stream (which once drove Gillingham's Mill). 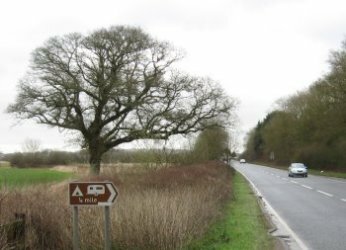 The oak was mature before the now-dismantelled railway and A31 were constructed, and is known verbally to us as "Candy's Oak", presumably named after the near-by Candy's Lane, now a very minor and narrow road, but once a main route from Wimborne to the West, avoiding the Stour floodplain and its winter floods. The oak stands on the edge of an 18 acre pasture field, enabling its fine shape to be admired from nearly 360 degrees around. The tree is likely to live healthily for another 300 years, but any disturbance to its roots might severely diminish this lifetime. The land around Candy's oak is owned by East Dorset District Council, and the tenant farmer lives at Candy's Farm in Candy's Lane nearby. On 29 Mar 2010 we got a flyer through the post from Nick King, would-be conservative candidate in the forthcoming General Election. This states six priorities in his program which would appeal to people living in Mid Dorset and North Poole consituency. "Improve our local roads. Upgrade the A31, complete the dual carriageway from Ferndown to Bere Regis, improve the A35 and build bypasses for Bere Regis and Sandford"
The linear wood to the East of Court Farm. The stream that flows East close to the A31, Court Farm to Lake Gates roundabout. A fine big old oak and ash, just East of the bridleway, OS ref: SY 987 986. 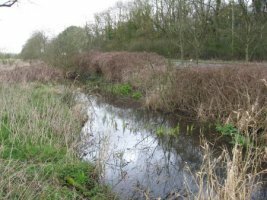 I am very concerned about the irreparable damage that may be done to this small area of Corfe Mullen if the A31 is widened. " At this point I contacted Corfe Mullen Nature Watch to see if Candys Oak had a TPO, and they suggested I contact East Dorset District Council, which I did. On hearing from you that the oak had no TPO, I decided one should be raised as soon as possible. 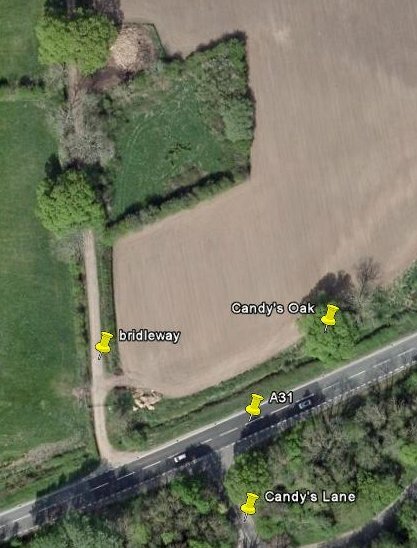 I want to ensure that Candys Oak does not disappear overnight, but at least is given a proper trial before execution. 2252- Oak and A31, looking E.
2245- Oak and A31, looking NE. 2250- Stream between oak and A31, looking E.
2251- Oak and A31, looking SE. 0- Candy's Oak on Council diagram. 1- Candy's Oak on Google Earth.